Why I want to read this: I bought a copy of this book on the recommendation of a fellow blogger, drawn to it because the tie in to the Vietnam War. It is written in verse, which appeals to me as well. I am hoping to feature this in one of my Poetry Corner posts. 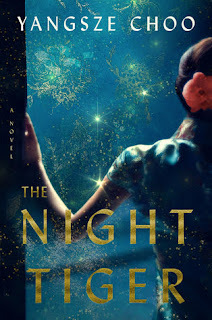 Why I want to read this: I read and loved the author's The Ghost Bride three years ago and am so excited to see the author has a new book coming out. She writes beautifully, and I am eager to dive into The Night Tiger. 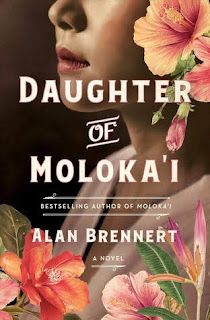 Daughter of Moloka'i is the highly anticipated sequel to Alan Brennert’s acclaimed book club favorite, and national bestseller, Moloka'i. It’s a companion tale that tells the story of Ruth, the daughter that Rachel Kalama—quarantined for most of her life at the isolated leprosy settlement of Kalaupapa—was forced to give up at birth. Why I want to read this: One of my all-time favorite books is Alan Brennert's Moloka'i. I did a little dance when I heard he had written a sequel--and then again when I read the summary. Manzanar World War II. I cannot wait to read this one. Do these interest you? What upcoming releases are you looking forward to getting your hands on and reading? All of these sound interesting. I'm interested in The Ghost Bride and The Night Tiger, but Moloka'i and its sequel also sound compelling. Jenclair - I do recommend The Ghost Bride if you get a chance to read it. And Moloka'i is heartbreaking, but worth it. Thanks for visiting! Like Jenclair, I say all of these sound good. I think I've had a copy of Moloka'i for a long time, unread as yet. Kay - I loved Moloka'i. I never expected a sequel, but am anxious to read it. It probably would stand well on its own given its about a different character. Thanks for stopping by! I've been seeing The Night Tiger around a lot and admit it's starting to sound better and better. Barb - I loved the author's previous book. I can't wait to dive into The Night Tiger. Thank you for visiting! These all sound really good. 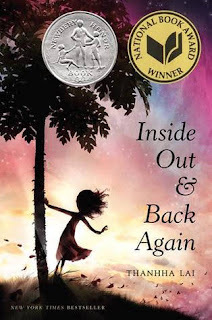 I have my eye on Inside Out & Back Again. I hope you get a chance to read all of them. Mary - I hope so too! Thank you for stopping by! Lark - I agree! I'm especially looking forward to that one. Thanks for visiting! The Night Tiger sounds really unique and different. I can see that one being pretty amazing actually. Greg - I hope it will be. It sounds really good. Thanks for stopping by! Donna Marie - I hope to get to Inside Out Again in the next couple months. We'll see how that pans out. :-) Thank you for visiting! Oooh, I love the sound of all three of these books, especially Inside Out and Back Again! I hope you find time to read them soon! Eustacia - I am eager to finally get to that one. Hopefully soon! Thank you for stopping by! All three cover look so amazing! Love them!! Thanks for sharing and thanks for visiting my blog. Happy reading. Vi - Aren't those covers gorgeous? I really like them too. Thank you for visiting! All of these sound wonderful, but I'm especially intrigued by The Night Tiger, which just sounds so unique. I hope you love all of these! Suzanne - I think The Night Tiger sounds very good as well. I hope it will be! Thank you for stopping by. I can't wait to read The Night Tiger! Erica - Me either. It sounds so good! Thanks for visiting! The Night Tiger especially intrigues me, though Daughter of Moloka'i isn't far behind. Hope you enjoy your picks! Laura - I hope I will too! Thank you for stopping by! Great CWW pick I have seen The Night Tiger book a couple of weeks ago and I absolutely love the gorgeous book cover. I hope you enjoy it when you get the chance to read it, thank you so much for stopping by my CWW post. Katiria - It is a beautiful cover, I agree. Thank you for visiting! I really enjoyed reading "The Ghost Bride" so I'm thrilled to see the author has a new book out! Melody - I hope it is just as good, if not better! Thank you for stopping by!